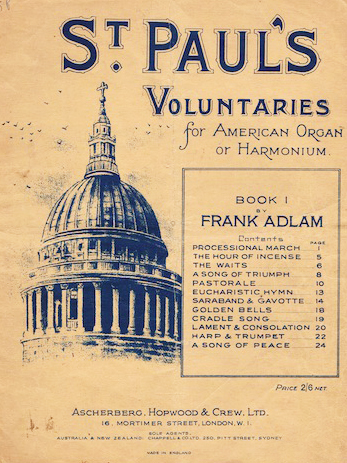 Frank Adlam, organist and composer, was born in 1857, the son of Abraham Thomas Adlam, who carried on the family shoe-making business in Salisbury. He was educated at Dorset County School in Charminster, and between 1878 and 1888 held the post of organist, firstly at St Phillip and then at St Thomas, both in Regent Street, London. From 1891 the census records his occupation as pianist and professor of music. Many of his compositions were of church music, some of which is still in print, but his output also included songs and piano music. His work was very suitable for the standard of the typical MHJ reader and player. At the time of the 1901 and 1911 censuses he was boarding with Frank Dean, whose company published much of Adlam’s music. Philip Sears’ youtube channel includes The Snake Charmer while Michael Hendron has also recorded several of Adlam’s church pieces, such as the March of Triumph. Adlam died unmarried in May 1929. There are several contenders for the composer who contributed several pieces to MHJ. Firstly, Frank Allen, 1851-1925, born in Durham, who after a selection of jobs which included Chemist and the Post Office, became business manager of the South Shields Empire in 1885. 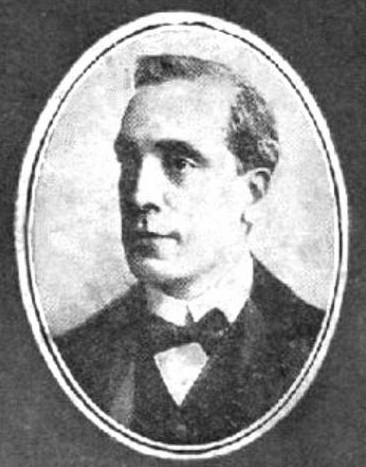 He was partly responsible for the change from “Music Hall” to “Variety Theatre” and on the death of Sir Edward Moss in 1912 became Managing Director of the Moss Empire Theatres until 1919. Secondly, another Frank Allen, born in Chelmsford, Essex in 1858, who lived Maldon St Peters most of his life. The census variously describes him as Professor of Music, Teacher of Music and Piano Tuner. His father John was also recorded as Professor of Music. Listings in Kelly’s Directories between 1890 and 1917 record Frank as a music publisher. The third Frank Allen was born in around 1868 in the St Pancras district of London. He began work very young, after his mother was widowed, and his first jobs are described on the census as “Clerk” but by 1901 he was a “Music Publisher’s Assistant”. Finally, there was an American composer of hymns by the name of T Frank Allen, but I have no other information about him. Any information to help me decide which Frank Allen is the correct one would be very gratefully received! Henry Robinson Allen was born in Cork, Ireland in 1809. He married Jane Coward in London in 1839 by which time he was a widower. His father was described as “Gentleman” and hers as “Surgeon”. They had four children, but it is not clear if there were also children from Henry’s first marriage. Most census returns record him as Professor of Music or Professor of Singing, but in 1861 he was recorded as Vocalist. After studying at the Royal College of Music he performed in opera, with his debut as Basilio in Mozart’s Marriage of Figaro in 1831. Many of his performances were at the Princess’s Theatre in Oxford Street, London, which as a smaller theatre was said to be more suited to his limited power. He retired early, probably in the 1850’s and spent the rest of his career teaching singing and writing ballads, the most famous of which was his 1861 setting of Byron’s “Maid of Athens”, which was published in MHJ Issue 104 in October 1906. Other titles included “As Steals the Dew”, “Green are Thy Hills” and “When we Two Parted”. 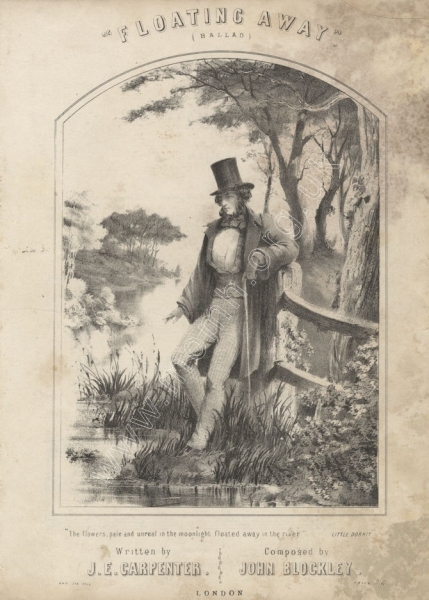 Another, ”Far Down a Valley Lonely”, was performed at the London Ballad Concerts in 1872 and the reviewer from “The Era” remarked that Allen’s “merits as a vocalist and composer have not been forgotten by his admirers” and asked that he “should give us more ballads of the same class”. H R Allen died in London in 1876. Born William Jordan in Melbourne in 1864, Harold Ashton began his career as a journalist with the Adelaide Register and turned to the theatrical profession in 1886 as secretary to J.C. Williamson. His time with Hugo’s Buffalo Minstrels gave him the skills and reputation to go into management and promotion on his own, initially as advance agent. Ashton’s career as an independent showman involved many facets of theatrical entertainment, including minstrelsy. In the early 1890s he toured his own company Ashton’s Federal Minstrels and acted as manager for Wills’ Surprise Party. Returning to Williamson’s he made many overseas visits for the Firm looking for theatrical imports, and spent time in South Africa as its General Manager. 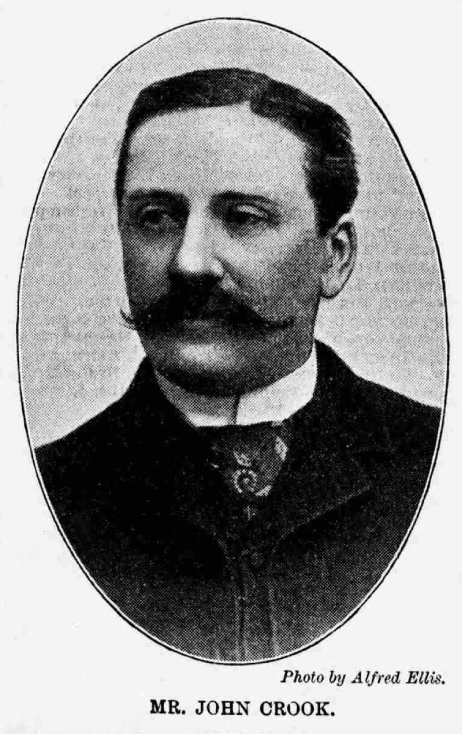 At the time of his death in 1917 Ashton held the position of Associate Director. The Harold Ashton who was associated with MHJ provided Banjo versions of songs published in the magazine. It is far from clear whether this is the same person. 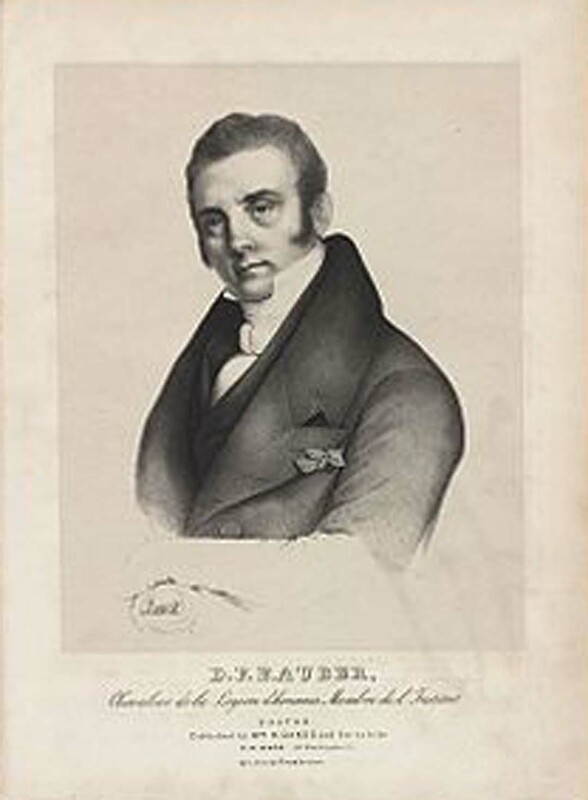 Daniel-François-Esprit Auber was born in Caen, France in 1782. He was the son of a Paris print seller, and although destined by his father to follow the same trade, he was able to pursue his interest in music, and learnt to play several instruments at an early age, taught by the Tirolean composer Ladurner. At the age of twenty he was sent to London to complete his business training, and afterwards became a pupil of Cherubini in 1805. Following the failure of his father’s business and his death in 1819 Auber turned to music professionally. 1820 saw his first major success, with an opera in three acts, “Bergère Châtelaine”. In 1822 began his long association with librettist A. E. Scribe, their first collaboration being “Leicester” in 1823. His characteristically French style achieved its greatest triumph in “La Muette de Portici”, familiarly known as “Masaniello”. This was produced in Paris in 1828 and rapidly became a European favourite. His most successful works were Comic opera and his religious cantatas and motets, written between 1852 and 1855, are much less well-known. 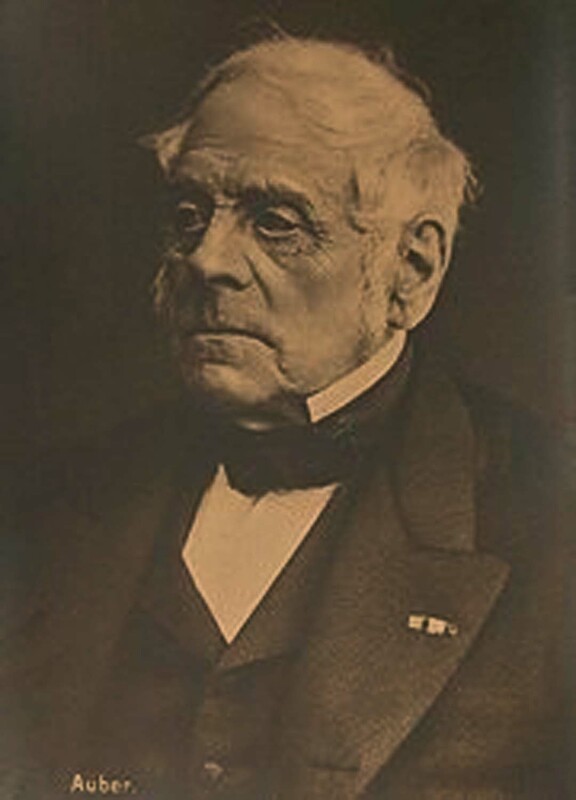 Auber was elected to the Académie Française in 1829, was appointed director of the Paris Conservatory in 1842, and became chapelmaster to Napoleon III in 1857. 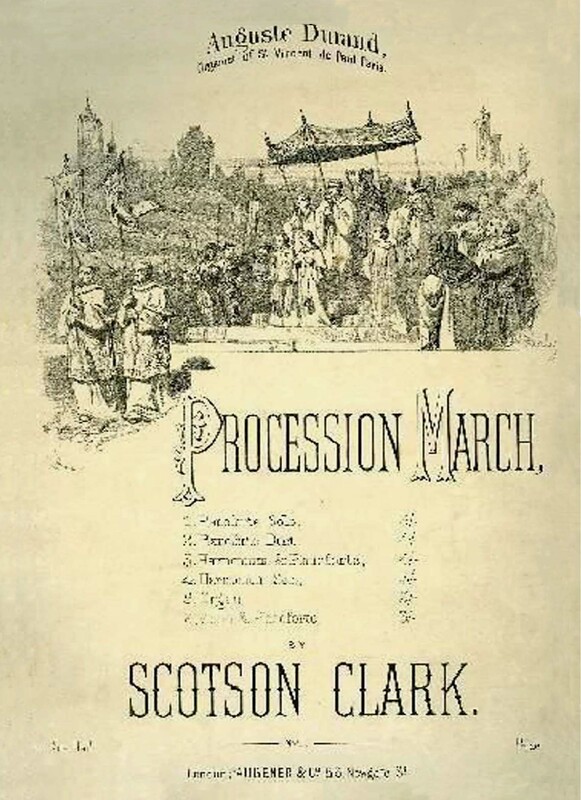 One of his last compositions was a march, written for the opening of the International Exhibition in London in 1862. He died in Paris in 1871. Not a biography, but a few snippets gleaned from newspaper reports. 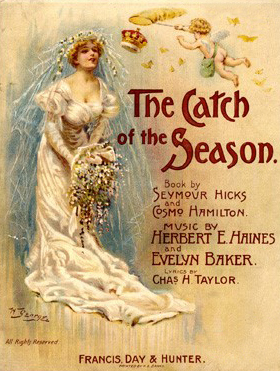 The earliest newspaper reports of Evelyn Baker come in 1904, where he is listed as a composer of additional pieces for Seymour Hicks’ musical comedy, “The Catch of the Season”, first produced in 1904 at the Vaudeville Theatre, London. 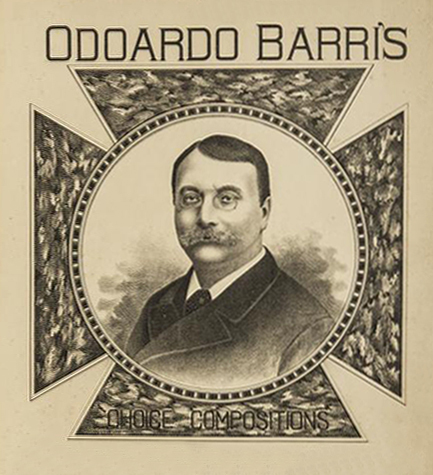 The principle composer was Herbert E Haines, for whom Baker also contributed pieces for “The Talk of the Town” (1905) and “My Darling” (1907). 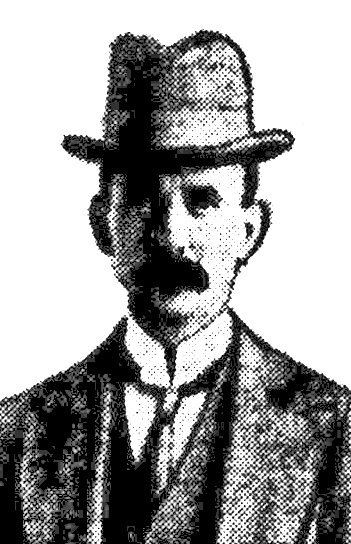 When “The Catch of the Season” was in the city the Manchester Courier reported that both composers were known there, Baker having previously been a teacher in Didsbury. In all Baker contributed 5 of the 22 musical items. The next reports, from 1907, refer to a touring production of “The Earl and the Girl”, again by Seymour Hicks, but this time with music by Ivan Caryll. The Sheffield Daily Telegraph reported that the touring company, managed by William Greet, included Evelyn Baker as director of the orchestra. Greet was an independent manager, associated with various London theatres, including The Lyric, The Savoy and The Adelphi, but it is not clear whether he employed Baker in London. 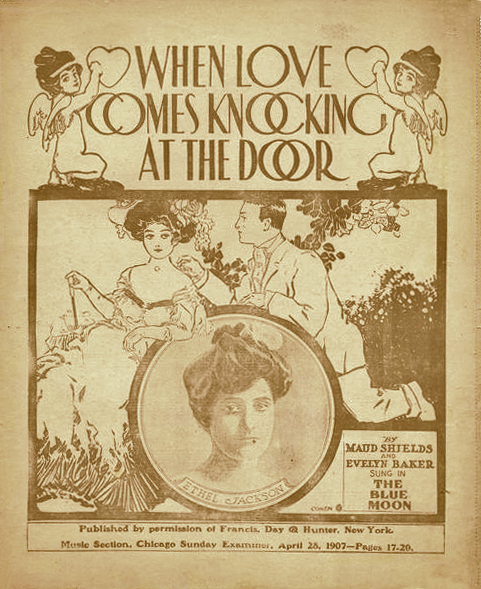 For the Sheffield production, one of Caryll’s original numbers was substituted by Baker’s own “When Love Comes Knocking at the Door”. The final reports come from 1917, with George Dance’s touring production of “The Bing Boys are Here.” where Evelyn Baker is again the director of chorus and orchestra. “The Bing Boys” was a revue which played successfully at the Alhambra Theatre, London during the last two years of World War I, with music composed by Nat D. Ayer. Again it is not certain if Baker was connected with the production while at the Alhambra, where the musical director was John Ansell. Possibly the most well-known song from this revue is “If You Were the Only Girl in the World”. Evelyn Baker contributed around half a dozen pieces to the Musical Home Journal. 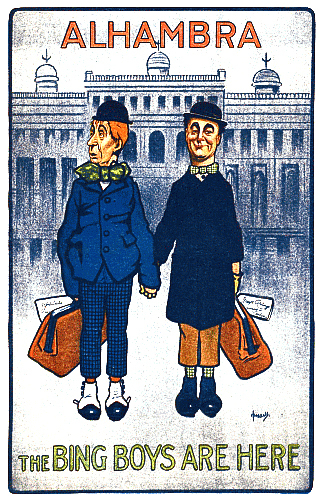 In 1937 a song entited “Friendship” was published by Stockwell. The composer was “Evelyn G Baker”, but it is not clear whether this is the same person. Another composer whose background may not have been exactly as claimed. In this case Barri claimed to have been born a British citizen in Como, Italy and to have fought at the Battle of Solferino in 1859. For the 1881 census, although the enumerator’s handwriting is not clear, he seems to have been a vocalist, possibly with the chief orchestra of the Royal House of Spain. 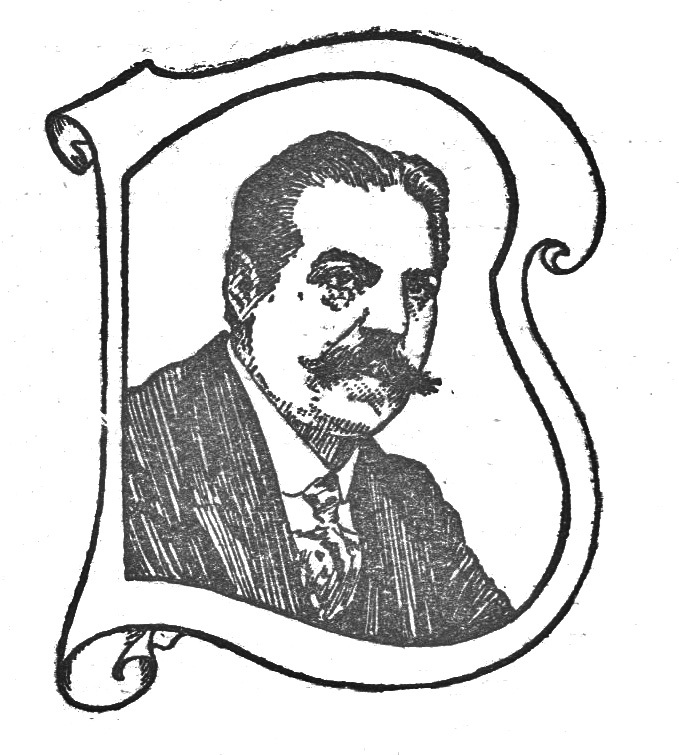 In 1883 an advert for a concert series stated that he was “Primo Tenore of the Opera Houses of Odessa, Malta and Milan”. He was actually born Edward Slater, in Dublin, in about 1844, and may have adopted his pseudonym while working as a singer in Europe. Back in England he ran a music school for many years, and was responsible for over 1500 compositions. At some point in the 1870s as well as contributing musically to the programme at the Garrick Theatre, he was also the Theatre’s treasurer. 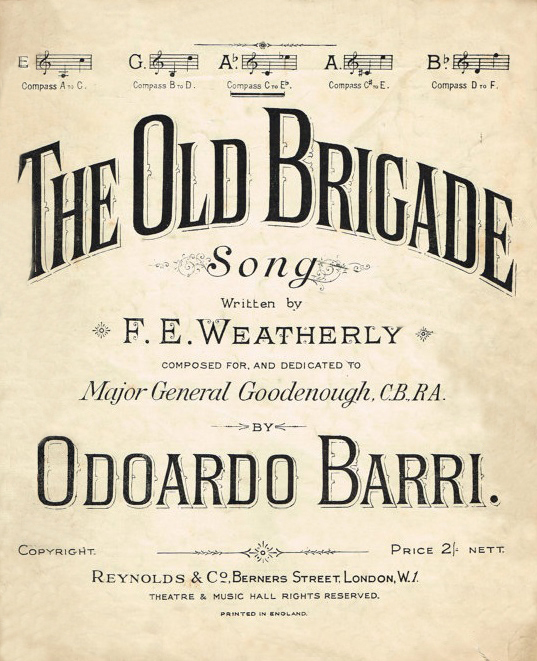 His most famous song was “The Old Brigade”, written with librettist Frederick Weatherly and published in about 1884. 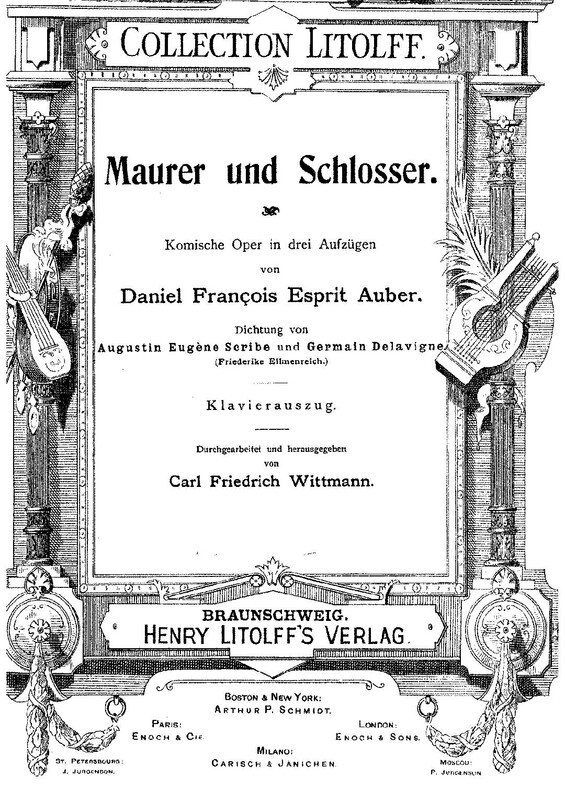 It was performed at the 1899 Promenade Concert. He married one of his pupils, Mary Catherine Stainer in 1900. She performed professionally as Maud Santley, and more about her can be found on the website of the Ryde Social Heritage Group at www.rshg.org.uk. The couple had no children and when Barri died in 1920 probate was granted to their housekeeper (as recorded on the 1911 census), although his wife outlived him, dying in 1952. He was a highly esteemed resident, and his death is much mourned by his musical friends and the general public. He was essentially a musical man, having shown quite early in life an aptitude for music. 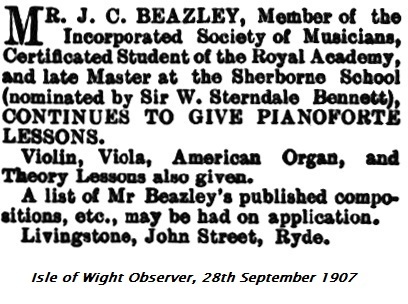 The only son of the late Mr. James Beazley, who was proprietor of the old Needles Hotel, Alum Bay, he became a student of the Royal Academy of Music, where he came under the notice of Sir Sterndale Bennett, for whom he acted for some time as his private secretary. His first outside appointment was as music-master at Sherborne School, Dorset. When the Royal Naval College was established at Osborne, he was appointed violin-master to the cadets there. 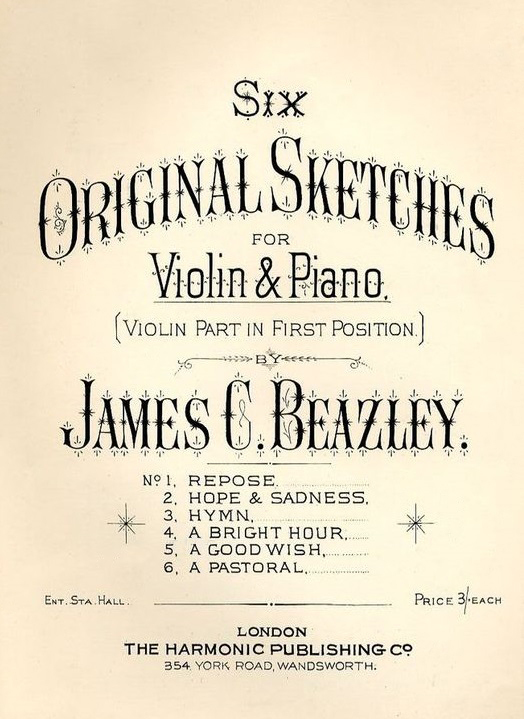 Mr. Beazley was the accompanist at the popular concerts by the R.M.A. Band, which were a prominent feature of the musical life of Ryde in the winters of some 20 years ago, and some of his compositions were played by the band. He was a very fertile and very clever composer; his compositions numbered some hundreds. They included two oratories, named “Drusilla” and “Josiah” both of which were performed locally with much success. 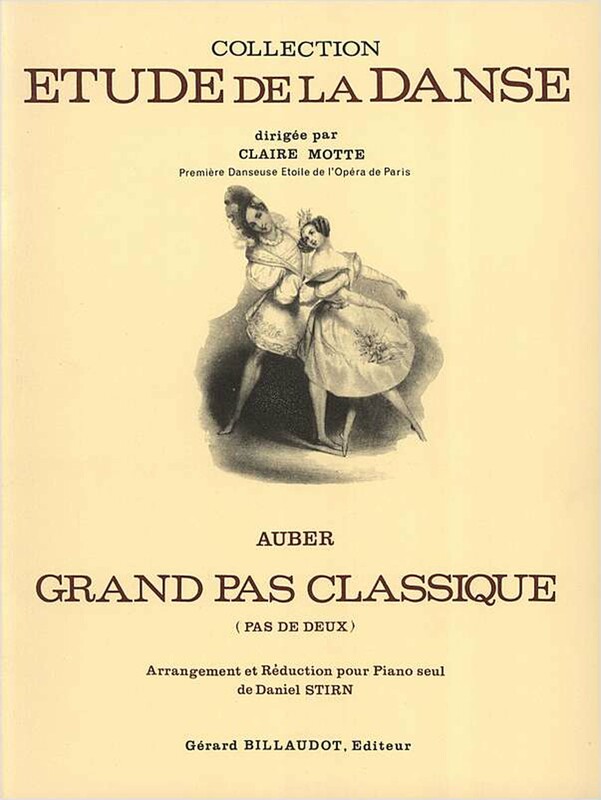 The dedication of one of his pieces “The Osborne Gavotte,” was accepted by H.R.H. Princess Beatrice. Some four years ago he gave two concerts in the Town Hall, the programme of which consisted entirely of vocal and instrumental works written by himself. He was a member of the Incorporated Society of Musicians, and acted for a time as chairman of its Southern district. Mr. Beazley’s chief recreation was in fishing, and while pursuing that hobby many years ago he sustained an accident which resulted in his becoming lame. He was twice married, first to the youngest daughter of the late Mr. John Meader, builder, of Ryde, who died in 1913, and afterwards to Miss Priestly, who survives him. He leaves two sons and two daughters. John Blockley was born in about 1800 and by the time of the 1841 census described himself as a Professor of Music. His particular métier was composing songs based on the work of poets such as Tennyson and Longfellow, which he published from about 1820 onwards. 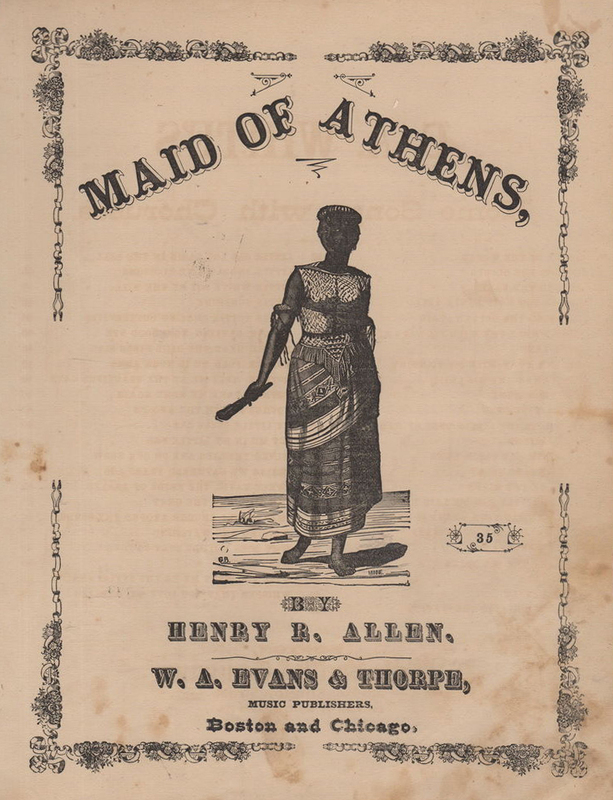 His success in this field enabled him to set up his own publishing business in the 1850s. Song settings of poems were especially favoured by Victorian singers, and Blockley was one among many composers who met the demand for music considered suitable for the middle-class drawing room. Blockley died in 1882, leaving a personal fortune in excess of £42,000. Real name Charles Arthur Rawlings, he was born in 1858 in Marylebone. His father, Arthur Charles Rawlings, was blind from birth and had trained as a piano tuner in the workhouse. Charles (and it seems his entire family) came to the attention of Georgina Weldon, an associate of Gounod during his time in England. The brothers, while part of her Orphanage/Nursery were formed into a bell-ringing troupe. 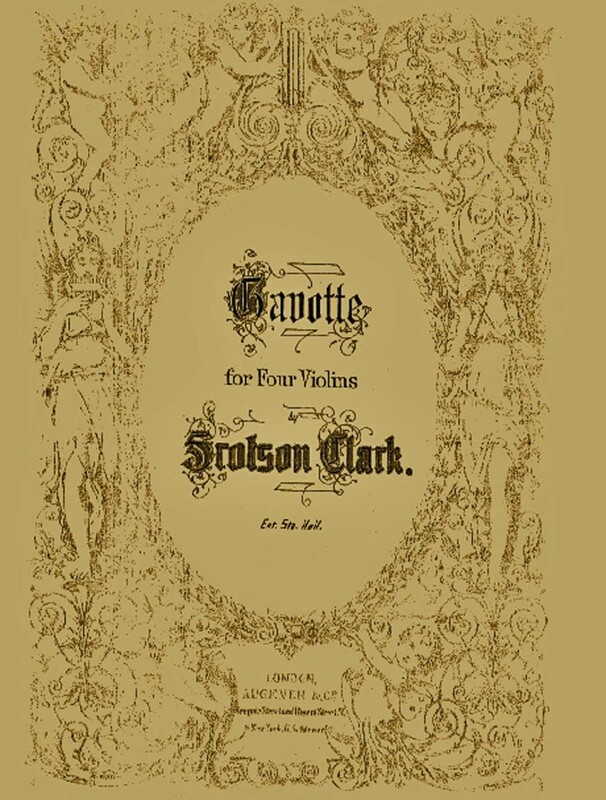 It is far from clear how much instruction the children received either from Mrs Weldon or Gounod, but Charles and his brother Alfred appear to have been the only musical “successes”. One of his compositions, “Till Dawn”, published with the pseudonym Gilbert Loewe, with lyrics by Alfred Hyatt, was sung at Promenade Concerts in 1906 and 1907. Charles used a large number of pseudonyms during his career. This was not unusual at the time – many composers wanted to separate their “serious” compositions from other work or to disassociate themselves from their own less successful work. It may also relate to Charles’ bankruptcy in 1895. Whatever the reason, “The Guinness Book of Musical Facts & Feats” lists him as the composer with the most pseudonyms! Two contrasting books about Georgina Weldon are “The Disastrous Mrs Weldon”, by Brian Thompson and “Storm Bird”, by Edward Grierson. A digital version of the English translation of Georgina Weldon’s “My Orphanage and Gounod in England” is available at: https://archive.org/details/myorphanageandg00goungoog . All make reference to the Rawlings family, sometimes not in the most complimentary of language. 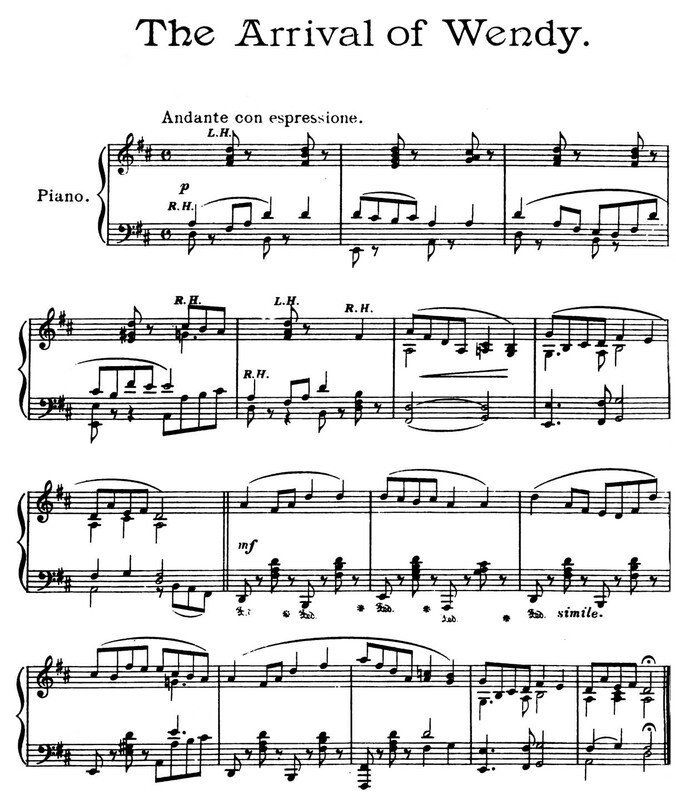 Le Brunn had one piece published in MHJ – the Waverley Gavotte, Vol 5, Issue 128, 10th April 1907. An advert in the South London Press on 26th September 1891 records him as the contact for the Waverley Orchestra, which was available for dances, concerts and dramatic performances. A later review in the London and Provincial Entr’acte on 24th November 1894 has a Mr Albert Brown LCM as the Director of the orchestra. Henry Albert Brown (1864-1925), who published the majority of his work under the name of Felix Godin, was a popular dance-band leader before the Great War. Apart from the Waverley Gavotte his work seems to be mostly waltzes, the most famous being Valse Septembre, which featured in the film Titanic. A biography of Godin published in The Era on September 28th 1920 when he was musical director for the Corporation of Douglas suggests that he was from a musical family, his grandfather having been organist at Antwerp Cathedral. His obituary in The Stage on 26 March 1925 states that he was originally a double bass player who also led the municipal orchestra on the Isle of Man. Because his birth name is relatively common I have been unable to trace his ancestry. He was seemingly no relation to George Le Brunn, (1863-1905), who had a brother in law called Albert (Albert F Hewer, a furniture salesman). George was a well-known musical hall songwriter. Felix Joseph Burns was born in 1864 in Perth, Scotland, but spent most of his working life in Carlisle. He was a prolific composer and publisher of light classical and popular music, including 16 dance albums. He was also the bandmaster of the 4th Border Regiment (Volunteers), a music teacher, organist and choirmaster, and accompanist for the Carlisle Winter Concert season. His census entries for 1891 to 1911 describe him as “Professor of Music”. He died in Carlisle in 1920, leaving a wife and nine children. John Mais Capel was born in Canada in 1862 to the Rev Arthur Douglas Capel, son of Rev Samuel Richard Capel, Rector of Wareham and Rebekah, nee Mais, the daughter of Rev John Mais, Rector of Tintern Parva. At the time of John’s birth Arthur was working as a Maths Tutor at Bishop’s College, Lennoxville. By 1865 the family were back in England, where Arthur was Curate to his father in Wareham, before moving to St Mary the Less in Cambridge by 1871. John studied at Magdalen College, Oxford and was privately tutored in music. From 1891 the Census lists his occupation as Musician. In early 1885 it was reported that Lord Tennyson had given Capel permission to set “The Miller’s Daughter” and “Come Not When I Am Dead” to music. 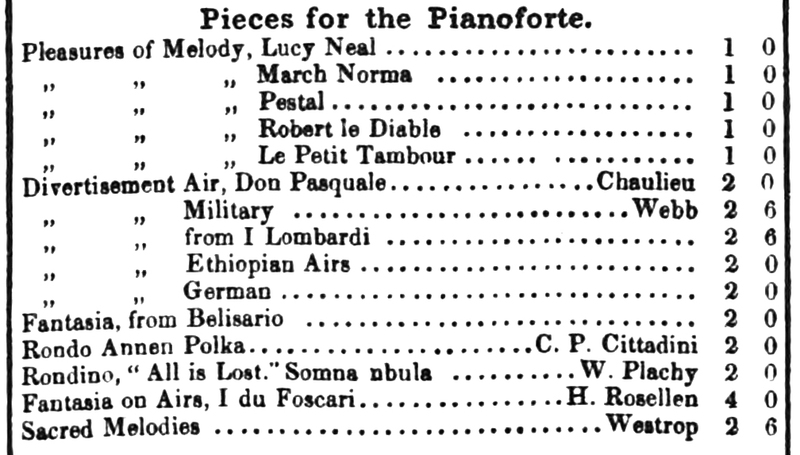 A concert including these newly published pieces was given at the showrooms of Collard and Collard Piano Company in July. One of the performers at that concert was Miss Lina St Ives, who also performed as Lucia St Ives. These were stage names of Lina Frances Massey, nee Willows, who John married shortly after. It would appear that the marriage was not a success as by the 1901 census he was again described as single. His WWI attestation papers also record him as single and there appear to have been no children of the marriage. Around 1892 Oscar Wilde wrote “The Faithful Shepherd”, possibly with the intention that Capel would set it to music, but this appears not to have happened, although Capel did set some works by both Poe and Byron. He also worked with Graham Clifton Bingham, a prolific writer and lyricist. In 1892 Arthur Chapman and Capel’s musical comedietta “The Composer” was produced at the Strand Theatre. One critic described the work as “the thinnest of trifles” but judged the music to be “decidedly tuneful”. 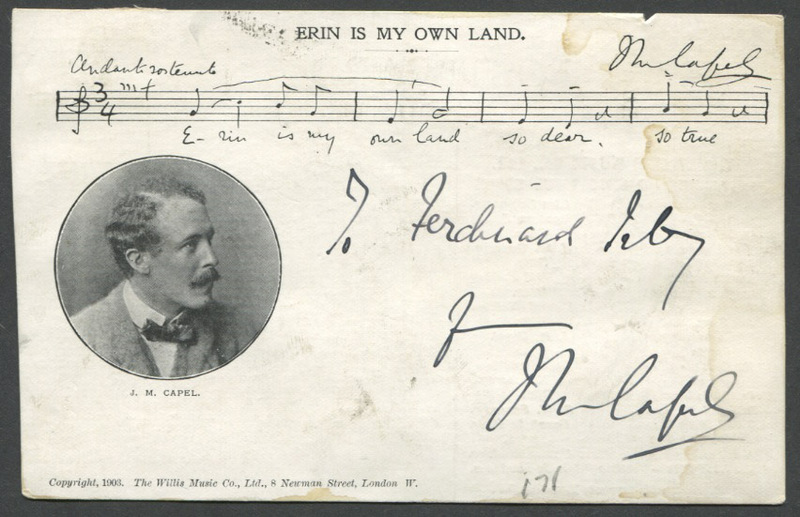 A theatrical singer, director and composer, Capel wrote over 100 songs, some of which featured in Promenade Concerts between1898 and 1925. A few are still available on CD collections of favourite songs of the era. Capel died in 1931 in Gorleston, Suffolk. It has not been possible to create a biography of Gaetano Pinchiori Cittadini, but a few hints are available. Newspapers in 1828 report on an Annual Subscription Concert arranged by a Madame Cittadini, where “Signor Maestro GP Cittadini will preside at the pianoforte”. A further report after the event describes it as a Benefit Concert for “Italian artists, who have seen better days”. 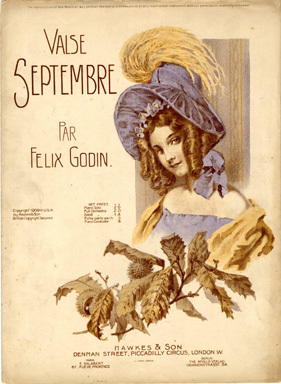 The following year another concert is advertised, acknowledging the “very kind and liberal support” received from “the Nobility and Public” which is the “only support of an unfortunate Family”. Cittadini published several piano pieces, often duet arrangements of works by other composers, but this and the annual concerts presumably did not produce sufficient income as he seems to have been involved in Insolvency proceedings in 1841 and may even have been in Debtors’ Prison for a while. I have assumed that Signor and Madame Cittadini were husband and wife, but they could perhaps have been mother and son. Cittadini married in 1843 Augusta Perfect, the daughter of a surgeon and the 1851 Census records him as a Professor of Music, born in Italy in about 1803, while she was born in Kent in about 1795. She died in 1871. Newspaper reports suggest Cittadini continued to give concerts up to the late 1840s, where he was described as “popular composer and pianist of the nobility’s concerts in London” and he was also a Mason and “celebrated pianist to the Grand Lodge”. Frederick Scotson Clark was born in 1840 and showed talent at a young age, playing the organ at the local church while still at school. He also sang and played the violin, and by the age of fourteen he was the organist at Regent Square Church in London. As well as studying and playing the organ in several churches, he founded the London Organ School and College in 1865 and graduated from Exeter College, Oxford, as BMus in 1867. In 1868 he was ordained deacon and he became a priest in 1869, possibly as a means of funding his musical activities. In 1869 he studied in Leipzig, under Reinecke and Richter, and in 1870 he continued his music studies in Stuttgart as well as serving as assistant chaplain. In 1874 he was a chaplain in Amsterdam and by 1875 had resumed his connection with the London Organ School. In 1878 he was the English official representative organist at the Paris Exhibition, where he was awarded a gold medal. In 1869 Clark married Catherine Eliza Brown in Brighton. The marriage seems to have gone wrong almost immediately, with frequent violent arguments, some of which were reported in the press at the time and when his wife’s petition for divorce was granted in 1873. Although Wikipedia suggests 6 children, this seems unlikely given that the marriage only lasted four years. Records are readily available for two – Kathleen (1870-1959) and George Frederick (1872-1927). 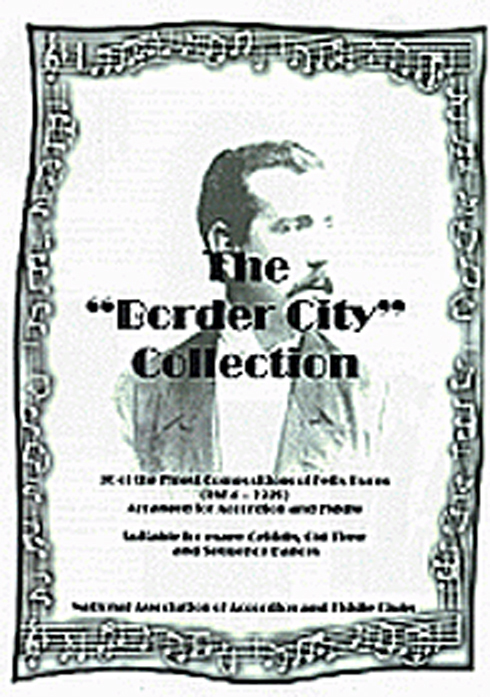 Clark published over 500 pieces for piano, harmonium and organ. One biography states that “his talents were considerable, but as a musician he lacked profundity, and his compositions courted popularity with the uneducated majority rather than the esteem of the educated few”. 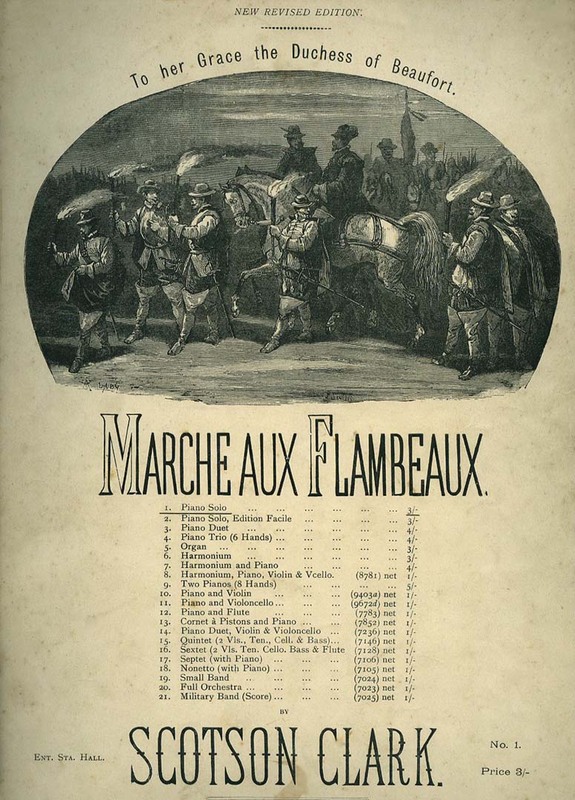 This trait could well have brought him to the attention of the editor of MHJ, who published an arrangement for violin by Henry Tolhurst of his very well known “Marche aux Flambeaux”. He died on 5 July 1883 at his home in London which was also his music school. John Crook was born in London in about 1847, and received most of his musical education in Norwich, including being taught piano by his aunt Madame de Belleville Oury, herself a pupil of Beethoven, and harmony and counterpoint by James Hill. He became organist of St John’s Catholic Chapel, a post he left to travel with English opera, firstly as chorus master and sub-conductor, and then as conductor in chief. In 1875 he moved to Manchester where he took musical control of the Prince’s Theatre and the Theatre Royal, composing ballets, pantomimes and a three-act opera, “The King’s Dragoons”. In 1883 he married Alice Burville (1856-1944), a singer and actress, best known for her performances in Gilbert and Sullivan operas and other operettas in the 1870s and 1880s. A move to London followed to conduct the comic opera “Indiana” at the Avenue Theatre. There he took charge of the music for the remaking of various comic operas, composing additional music where needed. He worked regularly as a conductor at a variety of theatres, including the Prince of Wales, the Theatre Royal, the Adelphi, Lyceum, the Duke of York’s and the Vaudeville. As musical tastes changed Crook found himself one of the most successful composers of popular burlesque and musical comedy songs, after which he turned his hand to composing original music for stage plays. The most well-known example of this is his work for Peter Pan. Early print versions of the play include some of the music alongside text and illustrations, the music having been described as being as important as Tenniel’s illustrations for “Alice in Wonderland”.